These days, many wireless devices are making their way to neighborhood homes thanks to advanced technology. While wireless doorbells are not exactly a new creation, older models were plagued with a number of issues; thus, improvements were made by different companies. The new breed of wireless doorbells is now more efficient and comes in a wider operating range compared to the older models as shown in our wireless doorbell reviews. So if you are tired of wired doorbells, check out the BESTEK Doorbell Kit and see why wireless doorbells are worthy of your investment. The wireless model has its own set of benefits which are preferable to the wired kind. Many homeowners have switched to this system because they are portable. This means you can move them from one place to another without hassles and you can carry them with ease as well, perfect for people who rent homes or apartments. 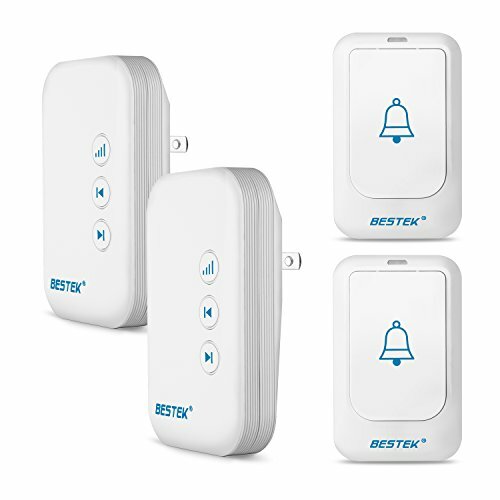 The wireless kind, like the Bestek Doorbell Kit, does not require wires in order to work so they are easier to install as well. Wireless devices also make way for other units. This kind of doorbell can support several push buttons which make them a practical option for homeowners who need buttons mounted at more than one door in their homes. This Bestek model can accommodate multiple push buttons. Furthermore, there are certain models which can work with home security accessories so you can further add safety to your home. These devices are also affordable and give you great value to your money. This doorbell kit comes with an LED flash function and a great selection of ring tones. It has a nice variety of plugin sounds, plus button selections, so this is suggested for good-sized homes and larger apartments. The additional chime makes the whole task of noticing the ringing of the doorbell easier in spite of your location in the house. Both chimes feature 36 sound options and it also comes with 4 adjustable volume levels. The unit includes a design with more than a million frequency codes which streamline programming and assists in preventing interference from other wireless devices that operate in the same range that the doorbell is working with. Every receiver can be operated with 4 extra push buttons. In case you wish to join up a new collection of four push buttons again, you might have to disengage the receiver for 30 seconds then plug it back in again and join up the new set once more. The preset codes will be cleared straight away following this. One important tip: In order to receive excellent working signal transmissions, it is best if you do not install the transmitter near metal items. The unit has a modern and chic look which is ideal for contemporary home décor. The chime selections are excellent as well and you have a broader range of tunes to choose from. It has a wider volume selection too, which is handy, and the distance range it provides is sufficient. This is a nice product, all in all, sturdy, has nice quality and the door buttons can be fastened to the door or the wall. Another great benefit of this product is that it offers an 18-month warranty. One drawback of this Bestek product is that it does not have a seal which keeps the item from coming in contact with water. Therefore, it is best used inside the house and not on an outside door. The BESTEK Doorbell Kit may not be suitable for outdoor use but it works excellently otherwise and is a whole lot more flexible and convenient compared to a traditional wired chime. It has a solid and sturdy construction, enough operating range, features which prevent the item from succumbing to interference issues, and is backed by a good warranty at 18 months. It has a wider selection of adjustable volumes and chime ring tones as well. Nice product from Bestek, as always!